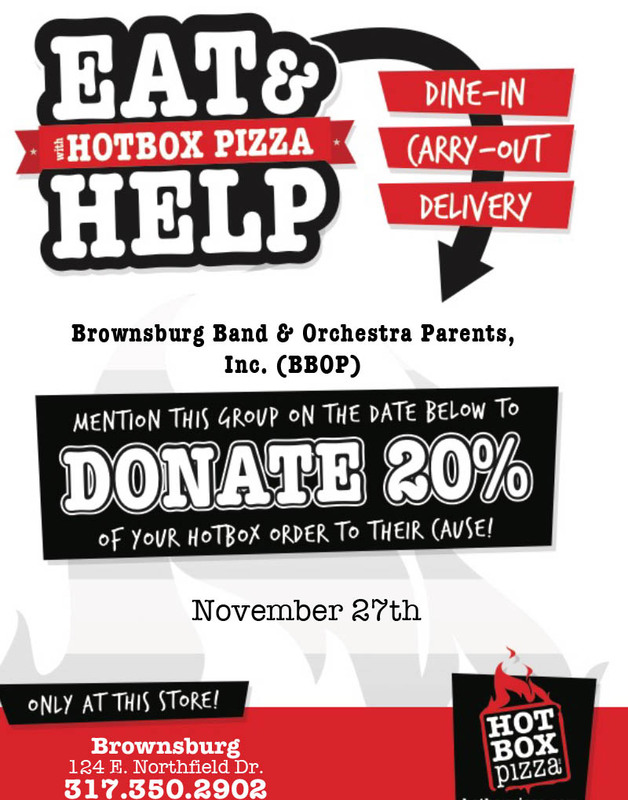 On Tuesday, November 27, HotBox Pizza in Brownsburg will donate 20% of your order to the Brownsburg Band and Orchestra Parents (BBOP). These funds will be used to help support a variety of band and orchestra programs and events throughout the year. Simply mention the group or show the flyer below when you place or order for dine-in, carry-out or delivery. It’s that easy! Feel free to print the flyer if you like, or show it on your phone. You’ll be getting some great pizza, supporting a local business and supporting your local band program. It’s a win-win-win! This Dine to Donate event is only valid at the Brownsburg HotBox Pizza, 124 E. Northfield Drive. 317-350-2902.